The resonance of the names of well-known climate change skeptics on significant climate change sites on the Web. 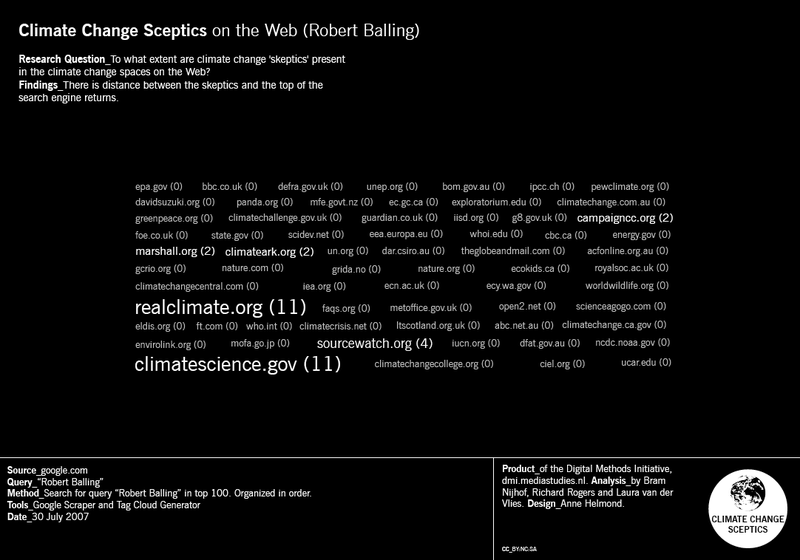 To what extent are climate change 'skeptics' present in the significant climate change sources on the Web? The question is posed in order to gain insight into whether the Web, and the devices that rank information, privilege the skeptics in ways similar to the news. 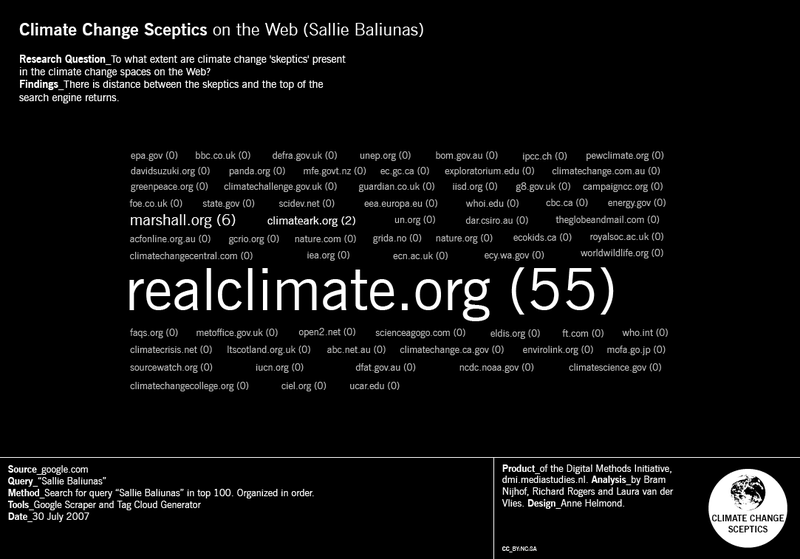 In the journalistic convention both sides of the story are represented, but in the climate change space on the Web, the skeptics’ presence is scant. Furthermore, the results also indicate that one may evaluate the partisanship of a source, or its commitment to monitoring the skeptics, on the basis of the resonance of the skeptics' names on each Website. 2. Determine the resonance of the names of the well-known skeptics in the top sources, or results, of a climate change query of the Web (Google). Query Google for climate change, i.e., query Google.com (or another national version of Google, depending on the project) for "climate change" (or the term in another language in the national version, such as Google.fr). The preferences are set to 100 results. Select all, and copy results to a file or to clipboard. Note that you may wish to de-select any sponsored results and/or adword results. Optional: It is advisable to seek resonance in only unique hosts as opposed to every page of multiple hosts in the engine returns. To clean the data for unique hosts only, copy and paste the 100 results to the Harvester, select return unique hosts and harvest. This provides a clean list of unique host URLs. The cleaned results are copied and pasted into the top box of the Lippmannian Device, and each skeptic's name is placed in the bottom box, one name per line, e.g. "Steven Milloy". Launch the Lippmannian Device, and keep your browser window open until it is finished, and the results are written. Note the tag clouds as results. In the tag cloud it is visible how many times a name appears on a Website, if at all. (In other words, a Website that has zero mentions of the name are also saved.) The equivalent search in Google is, for example, site:epa.gov "Steven Milloy". 3. Optional. Cloud the findings using the Tag Cloud Generator. That is, the tag cloud output of the Lippmannian Device is copied and pasted into the Tag cloud generator. This generator turns the results into pdf and svg files, editable in Adobe Illustrator. The pdf or svg file is opened in Illustrator. Now the results can be made more presentable in a graphic design sense, resulting for example in the designed tag clouds below. 3. 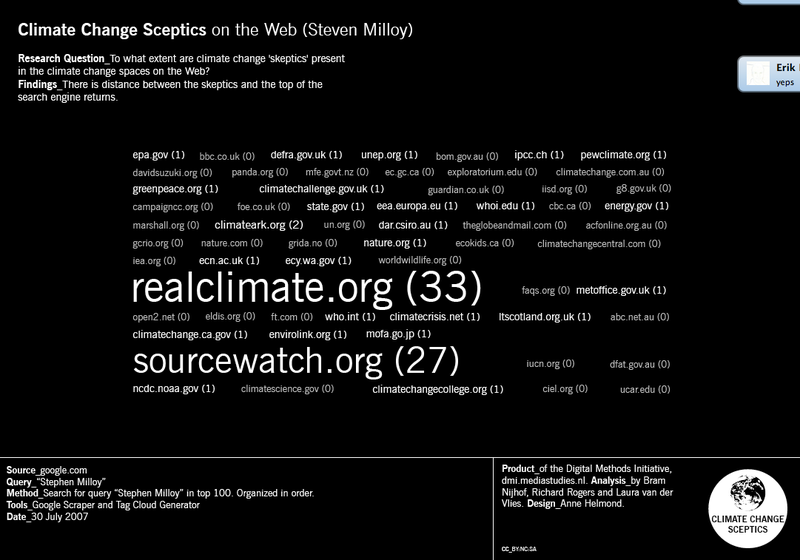 From the visualization one is able to see the "skeptic-friendly" sources, realclimate.org and, to a lesser extent, climatescience.gov stand out. 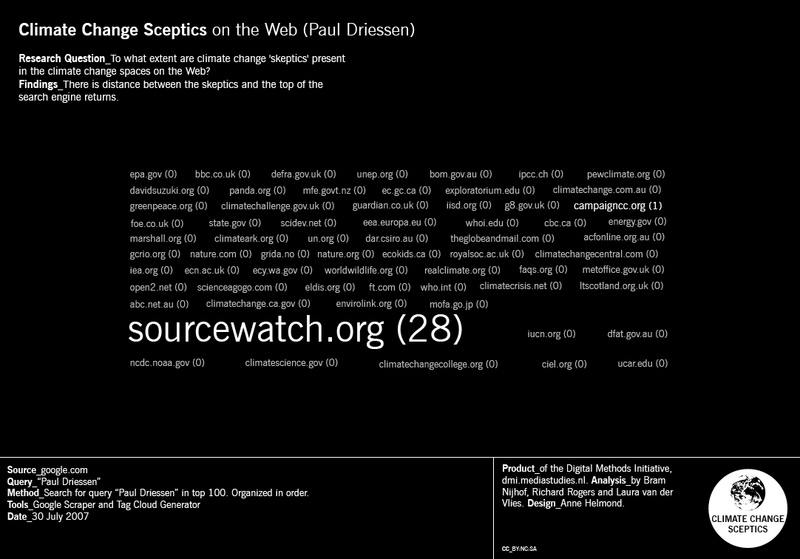 Sourcewatch.org also is prominent, albeit as a progressive watchdog group monitoring and exposing the skeptics' ties to industry. 4. 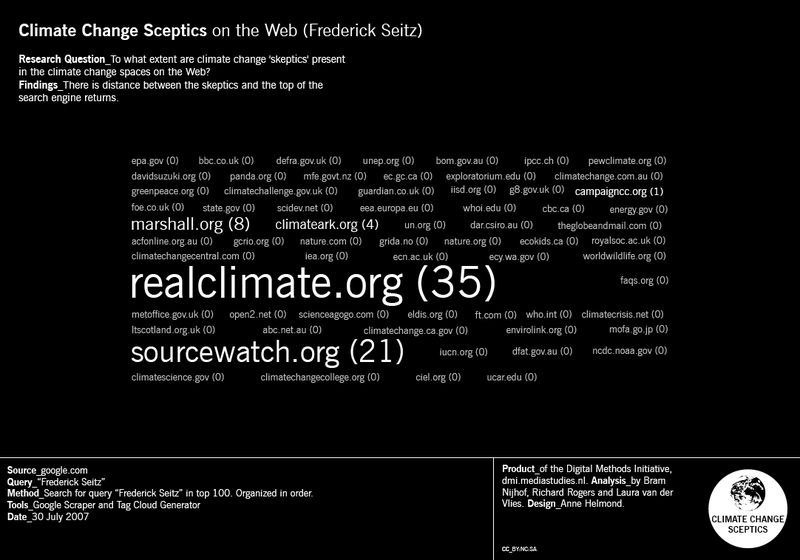 Remarkably, news sites, generally speaking, do not mention the climate change skeptics by name. Whilst news watchers and listeners may have the impression that 'uncertainty' in the climate change 'debate' continues in a general sense (as opposed to, say, in more specific, scientific sub-discussions), any climate change debate in the news appears to be discussed without resort to the well-known, or identified, skeptics. The question concerns the extent to which the Web stages climate change as a controversy as compared to other media spaces, such as news. A further step would be to query skeptical organizations in the same manner as the skeptics. A larger research undertaking would be to draw a comparison between the skeptics' resonance on the Web and in the news, at given points in time, using the Google News Scraper. Additionally, one may wish to expand the work from impact research (non-coded mentions) to coded research, using qualitative data collection means, where positive and negative mentions are analyzed. The tool provides a coarse view of a source's partisanship and/or issue commitments. Is an information source partisan?